With just enough heart, intelligence, and humor to hang its innovative action sequences on, Premium Rush may be lightweight as a thriller, but it’s well-acted, creatively directed, and full of exciting stunts. Joseph Gordon-Levitt (Inception, The Dark Knight Rises) stars as a courier who risks life and limb daily, braving insane New York City traffic on his bicycle. When he’s tasked with delivering an envelope with greater value than he realized, he must use his skills to outrun a violent corrupt cop and keep from becoming road-kill in the process. It’s a simple set up, but the execution is tense and invigorating, with dynamic camerawork and practical, in-camera stunts creating a real sense of danger. Gordon-Levitt has been slowly making the transition to legitimate movie star, and his athletic and likable performance here further cements that status. Michael Shannon (World Trade Center) gets some of the best lines as the villain, a quirky but dangerous detective with serious impulse control problems. Dania Ramirez, who failed to impress in Heroes and X3: The Last Stand, is spunky and smart here. The real draw, of course, is the originality of the action, offering something audiences haven’t quite experienced before. Though the storyline sometimes veers into predictability, Premium Rush is a solid adventure with which to close out the summer. 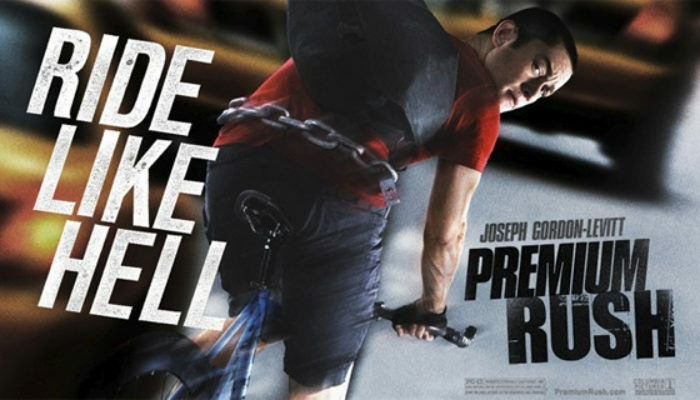 CONTENT OVERVIEW: Premium Rush is rated PG-13. It has one f-word, while moderate profanity is generously peppered throughout. A cyclist imagines several scenarios when riding through busy intersections; we see him getting hit and run over in his imagination. A violent scuffle, crucial to the plot, finds one man’s tooth knocked out while another man gets kicked, just off camera, in a vulnerable area, presumably the head, neck, or back (we don’t see the impact but we hear a crunching noise). A man is shot in the head, though only a small trickle of blood down his forehead is seen. Cyclists ride into traffic and occasionally wreck after colliding with cars or other obstacles. There are some innuendos, vulgar expressions, and two instances of raised middle fingers. MESSAGES TO DISCUSS: Sometimes helping others means risking our own safety. We must learn to master our anger. Few things in this world are as wonderful as a mother’s love for her child. Gambling can be addictive and ruinous to lives.